A little reminder to do what you LOVE! Stitch up a cute motivational artwork to inspire you everyday. This kit uses a midi sized 4” wooden embroidery hoop and full and simple instructions to cross stitch the slogan in pink hues. The finished cross stitch can be hung up on the wall or propped on a shelf – perfect for a bedroom or work area! 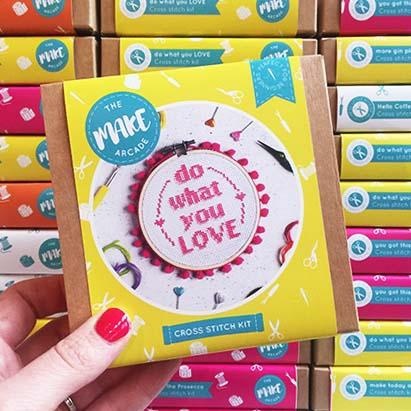 The kit comes packaged in a sturdy kraft box for you to store your stitching in if you get disturbed mid task and making it great for journeys and holidays or a fun and thoughtful gift.